An amber heatwave warning has been issued for Sussex by the Met Office. The Met Office is warning that there is a 90 per cent probability of heatwave conditions across Sussex over the coming days. The following advice has been issued for residents: “Stay out of the sun. Keep your home as cool as possible – shading windows and shutting them during the day may help. “Open them when it is cooler at night. Keep drinking fluids. “If there’s anybody you know, for example an older person living on their own, who might be at special risk, make sure they know what to do.! 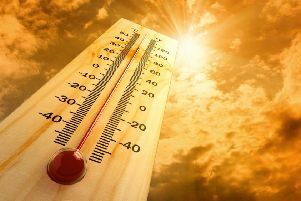 Although there is no official definition of a ‘heatwave’ in the UK, the term can be used to describe an extended period of hot weather relative to the expected conditions of the area at that time of year. The Met Office is forecasting that the warm weather will continue in Sussex over the coming days, with no respite from the heatwave in sight. A level four national emergency heatwave alert is issued by the Met Office when a heatwave is so severe and/or prolonged that its effects extend outside the health and social care system. At this level, illness and death may occur among the fit and healthy, and not just in high-risk groups.